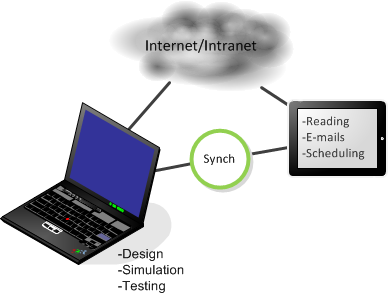 It’s fun to create accurately-drawn Visio shapes to represent the latest gadgets and network equipment. Judging by the page-views. 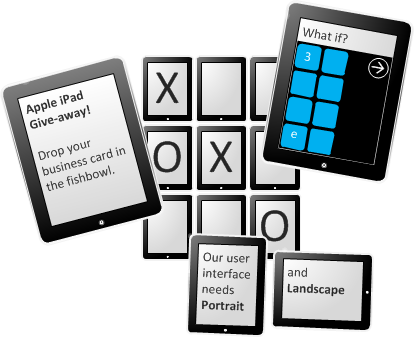 people love our Apple iPhone and Amazon Kindle Visio shapes, not to mention the USB Stick and ThinkPad shapes. These days tablets are the craze, so it’s time we produced the most elegant of them all: Apple’s iPad. 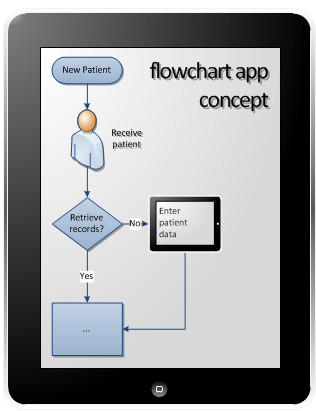 Our new Visio iPad shape can be used in lots of different diagrams. 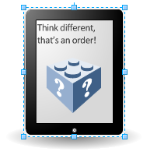 The iPad’s a SmartShape Too! The trouble with tablets is that they are fairly featureless, so there’s not much to draw. Since much of this web site is about making Visio show off, I wanted to make this shape more than just a pretty rendering. Using Visio’s ShapeSheet, I added a few special behaviors, which the sharp-eyed might have already noticed. When you rotate the shape, the text and the shading do some tricky things to make the shape more useful and more attractive. 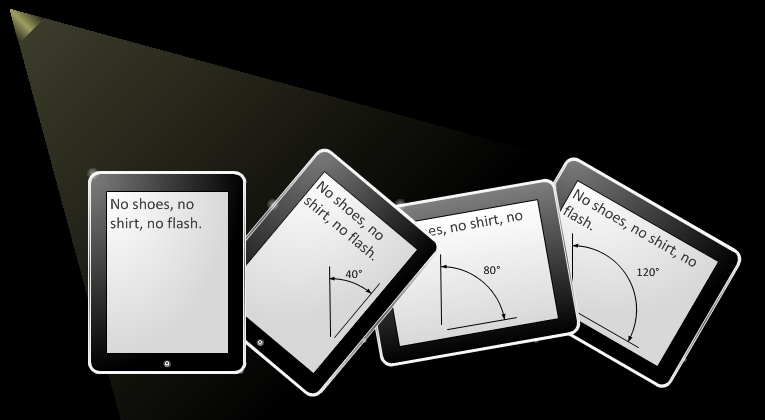 This even works if your iPad shape gets grouped with other shapes. It knows which way is up on the page, no matter what you do to it! 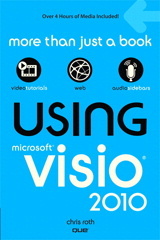 If you’re using Visio 2010, there’s even a little bit of Bling! In addition to correct shading, there are two little highlight reflections that add one last refinement to the shape. You can see the bigger one here. Notice how it stays in the top-left when you rotate the shape. The problem with smarts like this is that they seem so correct, you hardly notice them…until they’re not there! So check out the video for a better glimpse at this shape in action. If you don’t like the highlights, or they don’t print well, just right-click the shape and un-check Show Highlights turn them off. Remember, the highlights only appear in Visio 2010. They use new ShapeSheet functions for their positioning, so in older versions, they simply turn themselves off. The lighting effects might seem like overkill, but they do serve a useful purpose. 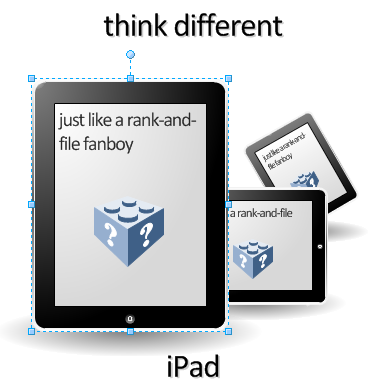 If you have a lots of iPads in your diagram, and they are all rotated rotated at different angles, readable text and consistent shading make for a pleasing visual. 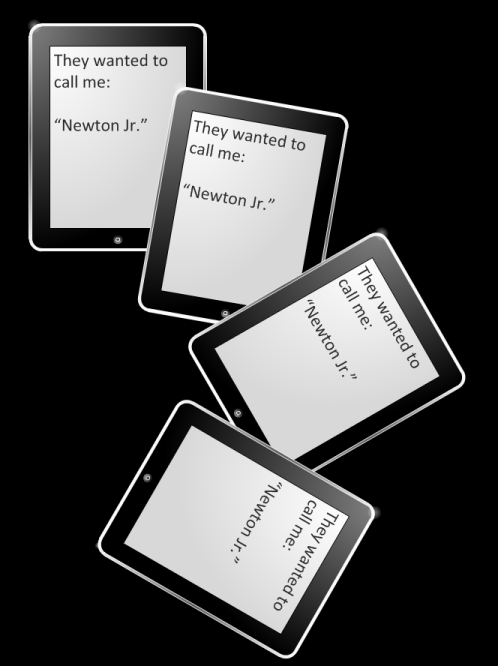 If you haven’t tried and iPad, they’re worth a look. While I’m not a huge fan of many of Apple’s practices, I do like their design and attention-to-detail. I imagine using a tablet to replace what I try to do on my iPod touch, mainly unimportant facebook stuff, e-mail cleanup, sports scores, video-telephony and reading. For novels, I’d rather have a real book or an eBook reader. But for technical books, I need the color, as well as the internet for looking up stuff. My back would be grateful for being able to keep up on technology and programming from the couch! I was in an electronics store the other day and did a very simple comparison between the iPad and Samsung’s Galaxy. I loaded www.visguy.com and scrolled the page. The iPad’s scrolling was smooth to the point of being buttery, but the Samsung’s was a bit jittery. If you think how much scrolling you actually do, this is quite important. The Samsung has more features and more freedom, but the little details like smooth scrolling made me appreciate the Apple product. It sits well in the hand. Since this website is concerned with creating diagrams, graphics and visualizations, check out this a cool visualization of statistics from Apple’s App Store. 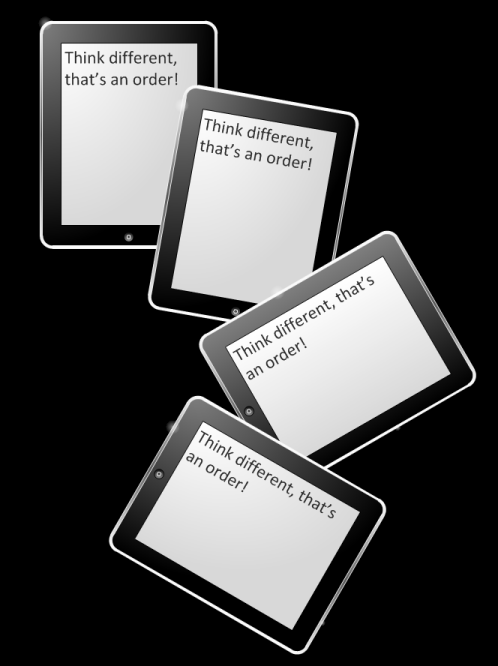 Great Stuff… need iPad image for a requirements doc. This is way better than using the computer Visio image and calling it an iPad. Thanks. I look forward to more updates. There’s a “Visio Download” link right above the last picture. You have to register with the site (helps prevent abuse) in order to download. If you’re not logged in, you are redirected to a page that explains registration. Love it, a bit late to the party me, it’s a good shape although not as good as your hats! Comment may be partially so I don’t get purged in the next pogrom!